“The sound of the word ‘heartless'” is nothing less than “horrible,” in Benedictine Father Benoit Standaert’s view. There is a striking difference between living “with or without heart.” It “is as great as the difference between heaven and hell, life and death, light and dark,” the Belgian priest asserts. It is vital, he suggests in “Spirituality, an Art of Living: A Monk’s Alphabet of Spiritual Practices,” that the key to unlocking the heart be found. Most people know instinctively what “heartlessness” implies. Christians tend to grasp, moreover, that a heartless life leads away from the values of the Gospel. They sense that heartlessness results in a somewhat cold, methodical approach to the surrounding world, an approach that rests too comfortably on the surface of things. But Christian spirituality focuses the eye, the mind and imagination on all the richness found below the surface of whatever is most readily visible to us. “I will give you a new heart, and a new spirit I will put within you. I will remove the heart of stone from your flesh and give you a heart of flesh. I will put my spirit within you” (Ez 36:26-27). The Spirit’s promise that life always can be renewed is the promise of Pentecost. 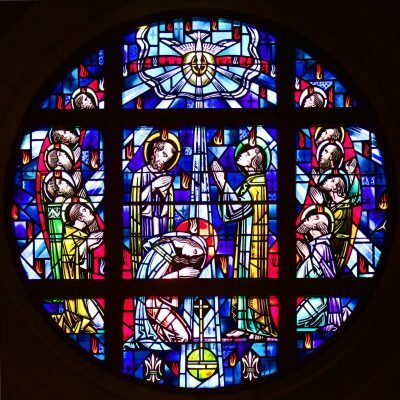 The church’s Pentecost Sunday prayer — “Come Holy Spirit, fill the hearts of your faithful and kindle in them the fire of your love” — is heard during Masses celebrated this day around the world. This means that the Spirit’s coming sets in motion a journey into holiness. For the Spirit is “the foundational principle of new life, holy life,” Father Standaert says. Pope Francis’ just-released apostolic exhortation on the call to holiness today, titled “Rejoice and Be Glad” (“Gaudete et Exsultate”), reproposes “the call to holiness in a practical way for our time, with all its risks, challenges and opportunities.” He situates holiness in the very heart of the actual lives people live. Many Christians may indeed suspect that holiness is for others, for people with some special talent or aptitude for following the patient, kind, hospitable and healing ways of Christ that holiness implies. There can be a tendency, moreover, to think that we know holiness when we see it and to surmise that those who appear holy must be greatly different from us. But Pope Francis is at pains in his new apostolic exhortation to assure people like you or me that our lives and activities fit well within the panorama of holy lifestyles. The challenge is to broaden our sense of holiness, he indicates. “We are called to be contemplatives even in the midst of action and to grow in holiness by responsibly and generously carrying out our proper mission,” he states. Does smiling, then, constitute a sign of the Spirit’s work? A smile can become a gift to others, even when we feel we have nothing else to give to them, St. Teresa of Kolkata believed. True enough, conversations about spirituality — all the ways of acting upon the Spirit’s prompting in prayer, reflection or service to others, for example — at times assume a serious, earnest tone. But joy and good humor are not foreign to saints’ lives, the pope insists.